How can anyone mistake holly for mistletoe? A quick rant, partly to test whether blogging direct from ScribeFire really works. 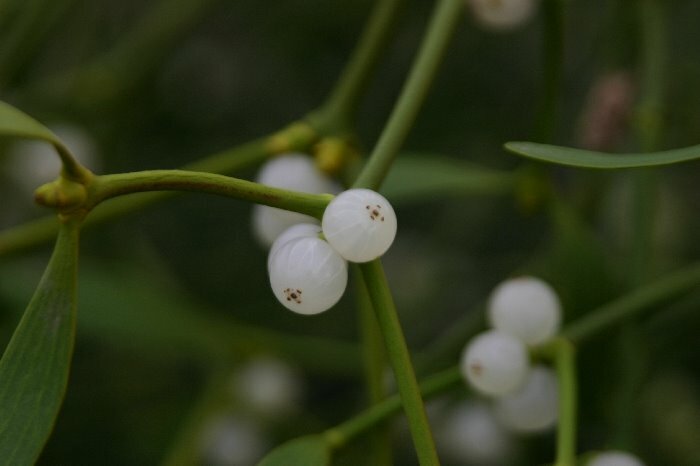 In my online mistletoe ramblings, I often come across sites that have holly labelled as mistletoe – and they’re nearly all in the US. 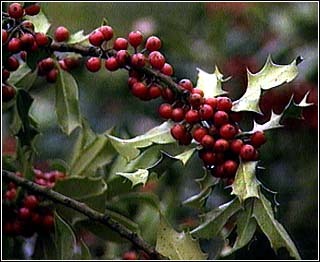 But how can anyone mistake holly – a prickly-leaved red-berried bush/tree for mistletoe, a totally non-prickly small tree parasite whose characteristic species (not all) have definitively white berries. I don’t know – but perhaps the clue is in my point that “they’re nearly all in the US” (they did elect Dubya, twice!, and now seemed over-awed by someone who looks like a page in a specsavers catalogue – but no, I must keep politics [if that’s what American elections are about] out of this blog!!). It’s so clearly holly that you have to wonder about CNN’s grasp of both the natural world and traditional customs. But maybe if CNN are that thick I shouldn’t be surprised about everyone else? Well, let’s have a quick look at Cafepress, a US-based design-your-own t-shirt, mug, thong etc site which is arguably a bit more grass-roots. In ancient traditions Mistletoe has often been associated with lightning, partly because of its forked, lightning-like branching pattern (see the pic) and partly because of its growth on old trees, which are sometimes struck by lightning. These old traditions have many variants, but usually involve hanging mistletoe in the house, sometimes all year-long, to ward off lightning strikes. Phnom Penh – Often armed with little more than a sprig of mistletoe and some magic words to ward off lightning, superstitious Cambodian farmers annually venture into flat, flooded rice paddies to work, and each year dozens get struck dead, officials said Monday. The problem is so bad that for the past two years at least, lightning has killed far more Cambodians than landmines, despite it remaining one of the most heavily mined nations in the world. According to official statistics quoted in the English-language Cambodia Daily Monday, 77 people have died from lightning strikes so far this year compared to nine landmine deaths through to July. In 2007 the paper said lightning killed 45 Cambodians and landmines claimed 26 lives. Not a very happy tale, but (to me at least) it is fantastic that mistletoe is still being used in this way. But what species of mistletoe are they using (and does it work?!)? There are many 100s of species around the world and only Viscum species similar to our own Viscum album has the forked branch effect – so is it just an old traditional association with mistletoe, or is the Cambodian mistletoe one of the forked-branch species? If you’ve dropped by looking for news about mistletoe for the 2008/09 mistletoe season you’re in the wrong place. Just back from the Sheffield Orchards Conference (see blog entry for 3rd Sept) and am full of new ideas and initiatives to take forward in my campaign for better mistletoe management (see 3rd Sept and various rantings from last winter season). More on all that in due course. But whilst there I was told about Ikea's mistletoe-themed kitchen worktop – which, of course, I just had to investigate. I assumed it was just one of those vague mistletoe-green items ( like those weird 'mistletoe-scented' candles you can buy at Christmas – which are really just a sort of mistletoe green – the scent is nothing to do wth mistletoe at all). But to my surprise I found that it really is mistletoe-themed – a reversible (green one side, white the other) mistletoe foliage patterned surface. But why? Even odder is that the only matching item I could find by searching the Ikea website is this 'free-hanging extractor hood' – which is designed for hanging over your kitchen island hob and contains lights and an extractor unit (capable of processing 274 m³/h and controlled, lights and fan, by the dangling stick). Click the image to see the mistletoe pattern. 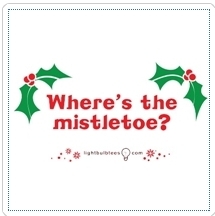 But why mistletoe? And why this hood unit? Especially as this extractor hood retails at £429.00. And just who wants a mistletoe-themed kitchen – other than me, obviously. A quick update for those keen on knowing about druidic mistletoe events. The Mistletoe Foundation's mistletoe event for 2008 is unlikely to be in Tenbury Wells as part of the Festival/Auctions this time (so not like the last 3 years). Instead the suggestion is that the event will be more like the 2004 Mistletoe Foundation event in the Forest of Dean (for info see the reviews on the MF site and/or my blog entries about that time). More on this soon – here and on the MF website. Living with Mistletoe. One hour pruning demonstration by Chris Fairs of Bulmers and Jonathan Briggs of Mistletoe Matters, in young and old orchards at Pixley House (GR663383) 11.30am and again at 2pm. No charge. Mistletoe in Art and Science, Jonathan Briggs, 19:45 – 21:00 Details and costs from here. A Mistletoe Meander at Much Marcle. A Plantlife Event with Jonathan Briggs. Details to be announced.